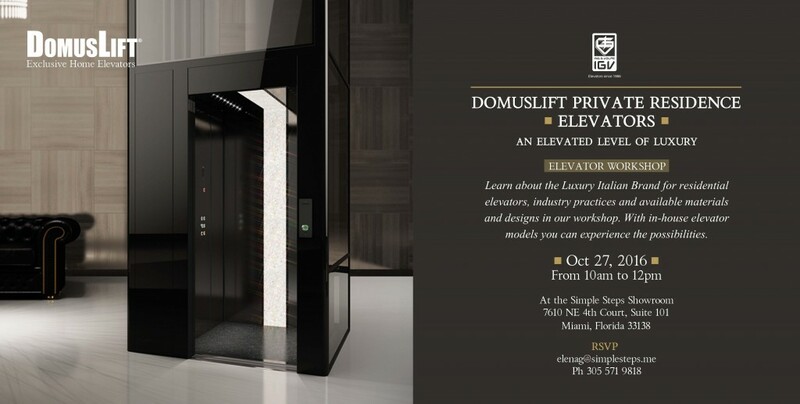 The “elevated level of luxury” offered by DomusLift, the luxury Italian brand for residential elevators, was the main focus of the event aimed at local designers and construction professionals. The workshop offered the chance to experience personally the various models, materials and designs available to fit any house décor. There were quite a number of guests attending the event: Michael Motomedian, Territory Representative, Nationwide Lifts (one of DomusLift Authorized Dealers with offices in 26 states in North America), Carmen A. Jiron Assoc. AIA, Architect, along with several local designers and Reinaldo, Alice & Camila Borges of Borges Architects with Yerickson Nagy. The event opened with a short video celebrating IGV and the 50th anniversary of the company. The range of DomusLift elevators includes bespoke models exported to more than 70 countries worldwide.